1. They’re lovely and soft against your skin so you hardly feel like you’re wearing a pad. 2. They’re flexible so they mould to the curve of your body and move with you. 3. There’s no sticky backing so you never get your pubic hair agonisingly pulled if you get your knickers down in a hurry. 4. It’s easier to get them in exactly the right place because they fasten with a press stud (on the wings) so you can reposition them. 5. They smell much less – once used, you fold and fasten them with the press stud and pop them in a pouch in your bag – they do not smell at all. 6. You’ll save money. Even though they seem expensive to buy, they work out cheaper in the long run. I’ve worked out how much money you could save. 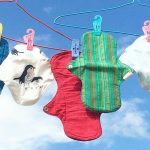 If you spend about £3 a month on pads then a set of cloth pads will pay for itself in 18 months. If they last 5 years (they can last longer) then you’ll save about £130. 7. They’re much prettier with colourful covers and beautiful stitching. I advise getting cloth pads with a white inside so that you can still see the colour of your blood. Some pads have coloured or even black insides which prevent you seeing the colour of your blood. It’s helpful to see it so you can track it – it can vary from black to brown to red or pink. Any changes to what’s normal for you could be a sign that something is not right and you should get a check with your doctor. 8. They’re easier to wash and get clean than you think – after use, soak them top side face down in cold water (add a drop of lavender oil or baking soda if you like). Rinse well until the water runs clear and hand-wash or pop them in the washing machine on a 30 degree wash with other laundry (don’t use fabric conditioner as it reduces their absorbency). 9. They have a lower environmental impact than disposable pads. In the UK the average woman uses 11,000 disposable sanitary products in her lifetime, which generates 125–150kg of waste. It’s estimated that there are 1.976 billion women of menstruating age on the planet – that is too many tonnes of waste to even contemplate! Fewer resources are needed to manufacture and transport reusable products from the factory to your home than disposables. They also create less waste at the end of their life. You can also buy organic cotton ones which means no pesticides are used. This is a good thing. Pesticides are highly toxic so they kill our wildlife, pose a health risk to those people spraying the chemicals when the cotton is growing – and you, when you use the pads. Pesticides can also cause pollution of our soil and water – and make their way into the food we eat. 10. If you buy from an ethical company, you can help lift other women out of poverty. 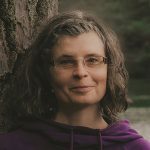 For example, I bought my cloth pads from Eco Femme because they provide a living wage to the women who make them in rural India and give one pad to a young woman in India for every pad sold outside of India as well as educating them in menstrual health. 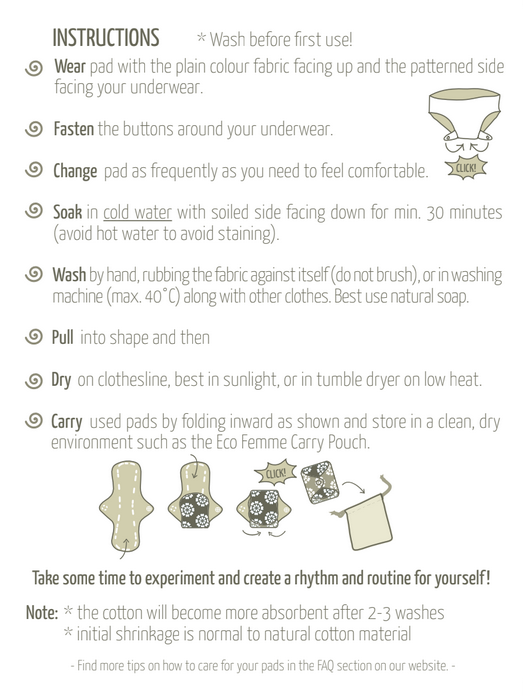 If you use them already, do leave a comment below, saying what your experience of cloth pads is. I have recently switched to cloth pads after reading an article about eco femme organic cotton pads and I’m really happy with my decision. It’s very safe for you and your environment too, thank you eco femme! Mam, you have written a Very nice and informative Article. These type of sanitary pads are really comfortable and safe for the environment as well. I myself use these and recommend it to others.